I can not believe how busy May was. It was a blurrrr. This last weekend, my husband his assistant baseball coach hosted a three day youth baseball tournament. Funny, how being married to the coach gets you automatically signed up to be a major part of food, organizing of volunteers, and so much more. Currently, it is now JUNE!!!! I am a few days late and a dollar or so short. What else is new... My busy platter is getting a bit emptier as we wind down the busiest month of our year...good ol' May. See ya! Thanks to Farley and her blog...Oh' Boy 4th Grade I am currently enjoying some quiet time to check out some great blogs and add my to the mix. So I have to share something...many years ago, I was nominated for the Disney Teacher of the Year Award. Yes, little ol' me here in Wisconsin. I was doing a great deal of work with my students that was unique and different...simulations, plays, and working hand in hand to teach citizenship. We did a great deal to help the Veterans and I even won the VFW Teacher of the Year. I go accommodations from our district and even won the Governor's Humanities Award. I am proud of what I did to help my students. That year...another teacher was up for that award. Maybe, you have heard of him...Ron Clark. Well, he went on to have a movie made about him...wrote some amazing books...and I pale in comparison. Do I still try to make a difference...of course. I lost my way there for a few years. Teaching wasn't the same. I stepped away from the regular classroom and starting teaching science to over 400 k-5 students. I found the passion again. Our school garden has helped me grow as a teacher! Cheryl at Primary Graffiti reminded me of that teacher that beat me out. I was inspired by her post. I went that day to check out his books at the library. I started reading the first book...The Essential 55. I finished it in one day. I am now on page 96 of The End of Molasses Classes. I have cried over 7 times...inspiring. I am motivated and ready to plan some great things for next year. I hope to inspire my colleagues by challenging them to read his books this summer. I will invite them to a book talk to share what we could do next school year~ I can make a difference! 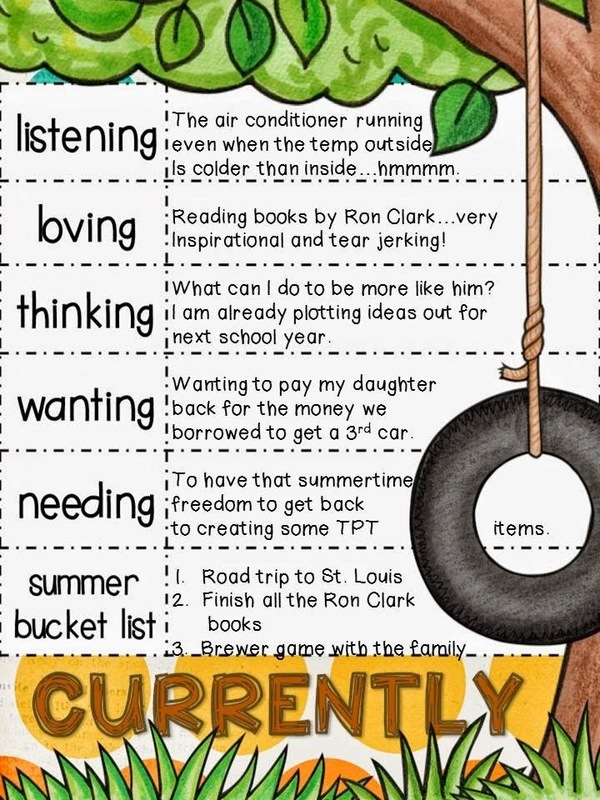 As I work my way through the list...I think about the extra jobs I am doing this summer to pay my own child back...college for kids (roller coaster science)...Community Connections (gardening on Wednesdays! )...summer science institute (improving science lessons using NGSS and more...) All ways to make a few extra bucks, but also keep myself focused on kids and learning! A win, win! I have a wonderful cousin, Kathy, that lives near St. Louis. She wants us to visit and stay with her...free room and board. Lots of great summer fun things to do and cheap. Sorry...gotta pay my kid back. Kathy and I in Minneapolis watching her daughter roller derby! I really want to finish the Ron Clark books before summer even starts...which is next Friday. I think I can pull that one off. Then, onto thinking up some great ideas to motivate my com padres. Thanks for stopping by. I am currently getting sleepy. Just found your blog through Currently! It's great to find another science blog! Thanks for the Ron Clark book recommendation. I saw Ron Clark at a conference last year. He really was quite inspiring but whew exhausting too. lol I loved his enthusiasm and his reminder to not get stuck in the rut. How exciting to be nominated with him! Congrats! Love your blog and am following now.